California Valley, September 28, 2012: John Ellias and Dean Gradwell set a new NAA (National Aeronautic Association) record for a "Distance to Goal and Return" flight with their RnR MXC cross-country gliders. Dean and John launched off a 300-meter regulation winch line, flew out a good 17 miles, turned around and landed back at the launch point for the 35-mile record (57.56 km, to be exact). This beats the previous record of 24 miles set in 2005. Paperwork has been submitted to the FAI, and once they approve, this flight is an official world record. John's report is an interesting read and shows how two nearly identical gliders flown by competent pilots on the same course and almost at the same time can encounter totally different flying conditions. Congratulations John and Dean! The Fall 2012 California Valley Cross Country Race happened in late September and proved that all thermals are solar-powered, specially at California Valley. For the first time, the 15th annual MCCC event lasted 7 days from June 11-17. It started with two practice days Monday and Tuesday, and there was a crew race on Wednesday. Thursday through Sunday were the race days. Consistent flying allowed team Screaming Eagles to win the event. Daily reports and photos have been posted at the XC forum at RCGroups. For the first time ever at Cal Valley XC Race, there were three days of contest flying. Three good days of racing with varied weather conditions which resulted in an interesting competition. As usual, the wind was a major factor. First Cal Valley experience on the RCGroups. The 14th annual Montague Cross-Country Cup enjoyed excellent weather. The five-day event drew teams from as far away as Colorado and New Hampshire. For the first time GPS loggers were used to record the flights which were then scored by computer. More photos. Also, follow the discussion on the RCGroups thread. The last contest of 2010 is on the books. Nine teams participated during this two-day speed task event. The Saturday task: 52 miles speed and Sunday task: 18 miles speed task. Results show that such a distance can be flown in the good lift at California Valley. We have a selection of photos and RCGroups thread has some more. This year the Montague XC contest tested a new scoring system. This system is exactly the same as used in fullsize soaring contests and has the potential to improve the accuracy of the contest scoring. Up to 12 teams flew three speed tasks, and results show that the course is getting flown faster and faster. RCGroups has a thread of the event with comments and photos. The hallmark of Thermal Safari is that it is not a contest. There are no trophies, no entry fees, only bragging rights. Thermal Safari is a cooperative effort among the various teams. Through radio communication, teams assist each other finding lift along the route. If the lift disappears, a forced landing along the route is a possibility. Winches or bungees will be used to get teams airborne again. The March 20-21 Davis Cross Country event hosted by the SVSS had 10 teams from the states of California and Oregon. Steve Henke, the event's co-CD has written a report, and Jim Rolle has taken photos of the two-day event. The results still show a MXC dominance. The Fall 2009 “Cal Valley” Cross Country event was held Halloween weekend this year. It was later in the year than it has typically been and the weather was very pleasant. John Ellias reports interesting late-year flying on a greatly expanded course. Official results and Dean Gradwell's report describe this year's event with eleven teams participating. Dan Edwards' and Dean Thomas' RCGroups threads have additional notes and photos. Simultaneously, the Soaring Society of America held a contest for Open and Standard classes, and some full-size pilots joined Saturday’s BBQ. As Dan Edwards put it in his report, this year’s California Valley cross country race was a research adventure. Chris Bovis of the Naval Research Lab provided a Skytrace GPS data logger to each team in order to collect their GPD logs of each flight. As part of their autonomous soaring research project, team ALOFT uses the data obtained from the teams to observe the thermal activity of the day and how each team made use of it. As a one-time exception, team ALOFT was allowed to compete and took first place as recorded on the official results. Kai Yang’s and “TrekBiker’s” RCGroup threads and the Autonomous Soaring website provide reports, photos and videos of the event. 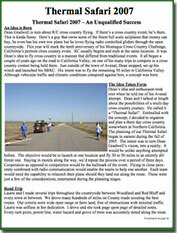 On April 18/19, the Sacramento Valley Soaring Society held its Thermal Safari cross-country soaring event. The lift on Saturday in particular was good, and all teams completed the 30-mile course without relaunching. Steve Henke's report posted on the SVSS website links to some YouTube video clips. The Down East XC race was blessed with nice weather and difficult flying conditions. 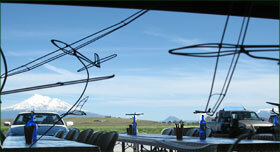 Saturday was very windy, and the thermals were weak on Sunday; however, everyone got out on course. Team ALOFT completed the course and tested some new software. For more info see this RCGroups thread and the ALOFT team members reports and photos. This year's Montague Cross Country Challenge was made challenging by blue sky with hardly a cloud in it. This made for great photos, flying in these conditions was demanding and fun, and every team had to make some great saves. The ALOFT team flew their autonomous SBXC loaded with electronics and achieved very good results on all three contest days. Ten teams of cross country enthusiasts swarmed Cal Val Lodge for the annual XC race held on Saturday, May 16th and Sunday May 17th. Mike Gervais' report describes the distance the 28 mile speed tasks. Results show team Ellias as the overall winner. Originally scheduled for March 15th and 16th, the Sacramento Valley Soaring Society (SVSS) 2008 Thermal Safari was postponed for a week, due to the weather. "Sunday was an absolute blast." and "What a great day!!!!!!!!!!!" describe the event. Participants' comments and pictures are posted on the SVCC website. The tenth annual Montague Cross Country Challenge was just that: challenging. On Friday, Dean Gradwell prescribed a 69.45-mile route around the entire course with return to base, a task which has never been completed before. Alas, team "Mister Bungle" (Greg Norsworthy, Jan and Joe Wurts) did it in just under 4 hours. On Saturday, the task was 2-hour-minimum speed with open maximum; the first 16 miles of the course were prescribed, after that it was open. A marine layer had pushed in, and no team made it past the 10-mile mark on their first attempt. Everyone relaunched, and eventually team "Hodgepodge" (John Ellias, Marcela Leal, and Dieter Mahlein) would have won, had they arrived at the field in time to turn in their score sheet. On Sunday, Dean prescribed a short race course which team "Mister Bungle" completed the fasted at a blistering 32.43 mph average speed. Jim Rolle's photographs depict great weather and lots of flying and fun. The scores of two-day race stablished Broken Aero as the overal winner. California Valley is located at the northern tip of the Carrizo Plain Natural Area Preserve. 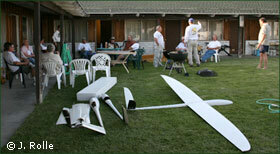 In March of this year, the Sacramento Valley Soaring Society (SVSS) held it's first "Thermal Safari." This is a cross-country soaring contest which started in Red Bluff, California, and ended in Woodland, about 120 miles farther south. The event lasted 4 days with over-night stays in Orland, Williams, and Dunnigan. 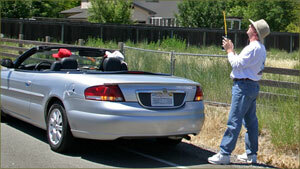 Thermal Safari 2007 is described in detail in the SVSS April '07 newsletter. It was very successful and a lot of fun, and we look forward to the next one in the spring of 2008. Please e-mail Scott for events. 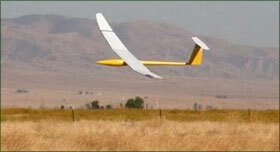 Radio-controlled cross-country soaring is a team sport. Each team consists of 2-4 people, with 3 being the most common: pilot, driver, and spotter. The gliders are which-launched. The team drives a vehicle while following the plane around a pre-determined course and turn points. Competitors are judged on total distance flown or fastet speed on course. Landings are not judged or part of the score.